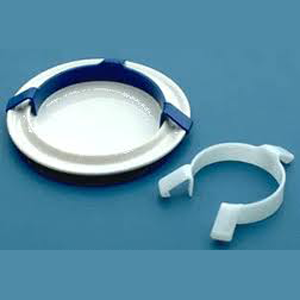 The Ableware Food Bumper is a food guard designed for use by individuals with upper extremity or neurological disabilities, stroke, cerebral palsy, or upper extremity amputation who want to use conventional tableware, but have difficulty getting food onto utensils and keeping food on the plate. These sanitary food bumpers clip onto any circular dinner plate 9 to 11 inches in diameter and provide walls against which food may be pushed onto forks or spoons. The plastic walls also prevent food from being pushed off the plate.